Land Girl Dorothy Sills (aged 19) from Middlesborough helps with the harvest on a farm in Yorkshire. For the latest publications on the WLA, please click here. Woodeson, A. (1993). 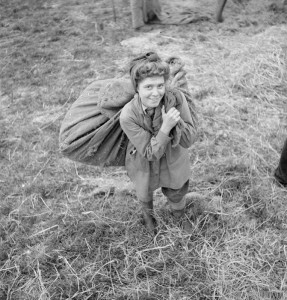 ‘Going Back to the Land’: Rhetoric and Reality in Women’s Land Army Memories. Oral History, 21(2), 65-71.